W.H.Y. Titcomb (1859-1930) was the son of the first Bishop of Rangoon. He was a professional artist who spent significant time both in Cornwall and Bristol, both of which were important to his art. Though an Anglican his art demonstrates a fascination with open air religion, probably a reflection of his father’s passion, as an advocate of parochial open air preaching. This is evidenced with ‘The Sunday School treat’ (undated) ‘The Church in Cornwall: A Rogation Day Procession’ (1906)’The Soldiers’ Communion’ (1915) ‘St Francis and the Little Sisters, the birds'(1908) and ‘A Pilot'(1905). An interest too in Methodism demonstrated by ‘John Wesley preaching in Bristol’ (1915) and ’Wesley preaching before the Mayor and Corporation of Bristol’ (1918), and then famously the Primitive Methodists. 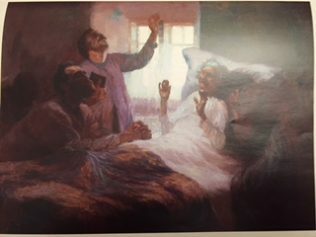 It was the three paintings of Primitive Methodists that he undertook based upon the St Ives Prims that are of special significance to Methodist historians. 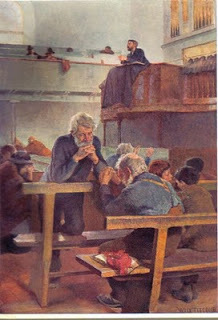 The three are ‘Primitive Methodists at Prayer’ (1889), ‘Piloting her home’(1899)-also exhibited under the title ‘Crossing the Bar) (1894), and ‘A Mariner’s Sunday School’(1892). Through these latter paintings Titcomb became known known as the “Painter of the Prims” (see David Tovey Methodist Recorder July 1985). However the one above all is “Primitive Methodists at Prayer”, depicting the faith of the Cornish Fisherman who were quoted in the 1896 report on the Newlyn Riots, as referring to their faith as ‘the brightest and best’ part of life. 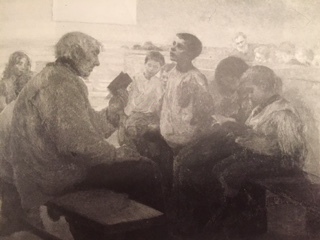 The Morning Post gave a contemporary comment: “Like the Quakers the Primitive Methodists are rapidly disappearing –this picture painted with a simplicity suitable to the subject, is a faithful representation of a scene historically interesting as portraying the remnant of a vanishing institution, and touching, very touching with its gentle unaffected piety.” In fact in the year the painting was exhibited there was a revival led by the Scottish evangelist Rev. Nairn.